The 2019 season brings a unique amenity to the Round Rock Express‘ (Class AAA; Pacific Coast League) Dell Diamond, as the new Home Run Dugout has been added to the ballpark. Dell Diamond has undergone a change to accommodate the new Home Run Dugout and attached Bullpen Bar, which combine a full-service bar and restaurant with an interactive experience for fans. 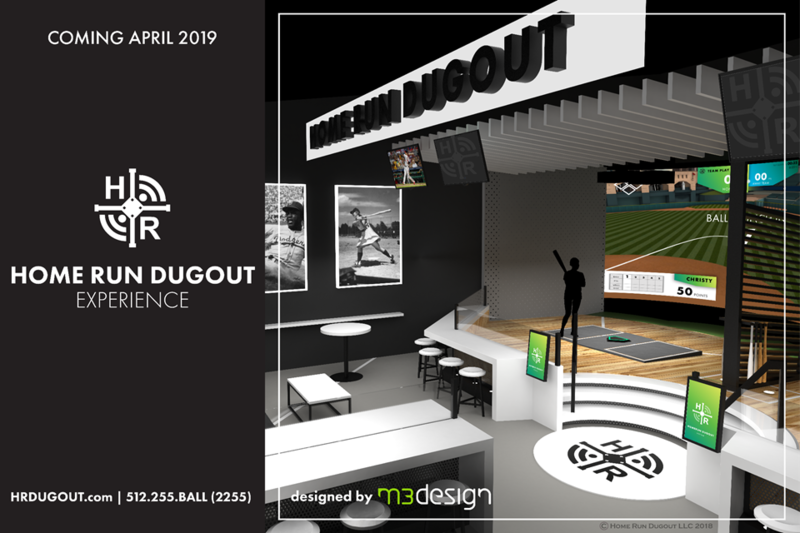 Located beyond the outfield wall at Dell Diamond, the Home Run Dugout features two batting bays that part from the traditional batting cage concept by including technology such as augmented reality that allows users to take swings at the Major League Baseball ballpark of their choice. It also features a ground-up pitching system instead of the traditional pitching machine found in most batting cages. That’s the augmented reality part. Always had a dream of knocking a homer into the stands at the Boston Red Sox’ famous Fenway Park? Or want to feel the thrill of playing a little closer to home at the Houston Astros’ Minute Maid Park? Before you start swinging the bat, you can choose any professional ballpark of your choice to play at, so to speak, and watch where the ball would land within it. The system tracks the ball’s velocity, distance and landing location at the chosen park…. But you can make a full night of it. Home Run Dugout, with the attached Bullpen Bar, doubles as a full-service bar and restaurant with what Bloomquist calls “elevated ballpark food” and a range of beer, wine and cocktails. The mixed drinks are his particular specialty: He is formerly the CEO and co-founder of Empresario LLC, a conglomerated company now known as Dripping Springs Distilling that carries a portfolio of brands including Republic Whiskey and Tequila and Paula’s Texas Spirits. As was announced over the offseason, this new amenity is located within Dell Diamond’s former Fireball Grill in right field. After opening the season on the road, the Express will return to Dell Diamond for their home opener on Tuesday to host the Nashville Sounds.